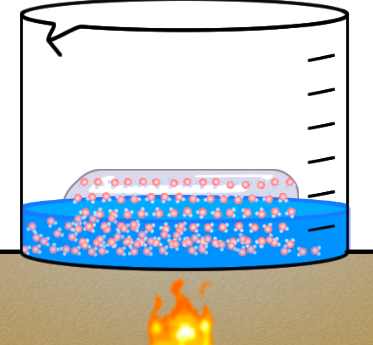 In this HTML5 melting and boiling simulation, an ice cube is melted into a beaker as a flame is applied. Molecules of water are overlaid onto the image of the ice cube and the image of the water. Once the liquid water reaches the boiling point, it evaporates as steam. 1. As the ice cube melts, the water molecules are freed from their trapped state and can now roam about the glass beaker as a liquid. During this melting process, temperature stays constant at 0 degrees celsius. 2. Once the ice is completely melted, the liquid water molecule can now move faster and faster as heat is applied. This is seen as a rise in temperature. 3. Once the liquid reaches 100 degrees celsius, it no longer rises in temperature. Instead, the water molecules are moving so fast that they leave the container as steam. Thank you for this film. But it has some things, I think need attention. – The pausebutton doesn’t work. Very annoying to find out. – The liquid starts to boil at 90 degrees. – The number of degrees has no unit. – It’s going real fast! Maybe slow down at key-ponits, like the moment all ice has become liquid and around the temperature the water starts to boil. – Could you add some key words at key points to emphasis what happens or what to look at. – Cool how you make the molecules move! – Nice way te see how the ice melts down! This is video is helpful to students as it is. Besides what Jan has mentioned in the comments section above, you might also want to show some of the water molecules continually rising up and out of the beaker, evaporating. Thanks for the comments. I really struggled with this one. At first I wanted to approach it entirely as a physics simulation showing how the attraction and repulsion between particles could result in the emergent phase behavior. I quickly found out that the physics engine behind it couldn’t put enough particles onscreen to show this in a convincing way. In the end, I kept the collision behavior and computed the water level based on how many particles are “in” the container. The result isn’t that great, and I’m thinking I need to remake the whole thing from the ground up as just a pre-rendered animation. At the moment I’m up to my eyeballs rewriting the Chemthink simulations for HTML5. Once I finish those I will try to come back to this one. In the interim, I’m wondering what to do with this simulation. On the one hand, I don’t want to confuse people with a bad simulation. On the other hand, the basic behavior is mostly correct. What do you think, should I take this one down, or leave it up? If you could just fix the boiling point, I think it is worth putting up. The inaccurate boiling point is the only thing keeping me from sharing it with students. I just adjusted the boiling point and tweaked it a little. Its not perfect, but it is better. The boiling process is still way too fast compared to the amount of time it takes to raise the temperature by 100 degrees. I think to make things right I will need to remake the whole thing as an animation instead of a simulation. I like this, but wish it was more like http://mutuslab.cs.uwindsor.ca/schurko/animations/waterphases/status_water.htm. I can no longer run this animation due to it using an old Java platform. It showed the molecules, similar to what you have here, but instead of the temperature reading at the top, there was a thermometer as a scale (with values) on the side of the animation. You could pause it also. As you mentioned previously, the timing also needs some adjustment. This is the closest thing I have found to the mutuslab link – thanks! I was able to get this Java simulation running on my computer, and am definitely looking to copy it. It is on my priority list after I publish the HTML5 version of the Chemthink “Atomic Structure” tutorial — hopefully by tomorrow afternoon.